If you are in the market to upgrade your existing security camera system or to purchase a new system, then this DVR is definitely a good pick for a 4 camera system. It is the latest in Security Camera DVRs that utilizes the highly acclaimed HDCVI technology that allows use of HD security cameras over coaxial cable. HDCVI cameras and DVRs are the answer for customers looking for HD security cameras on a budget. Not only is the cost per DVR and camera lower than IP cameras, but you can also use existing RG59 coax cabling (min 20awg) to run the video signal. 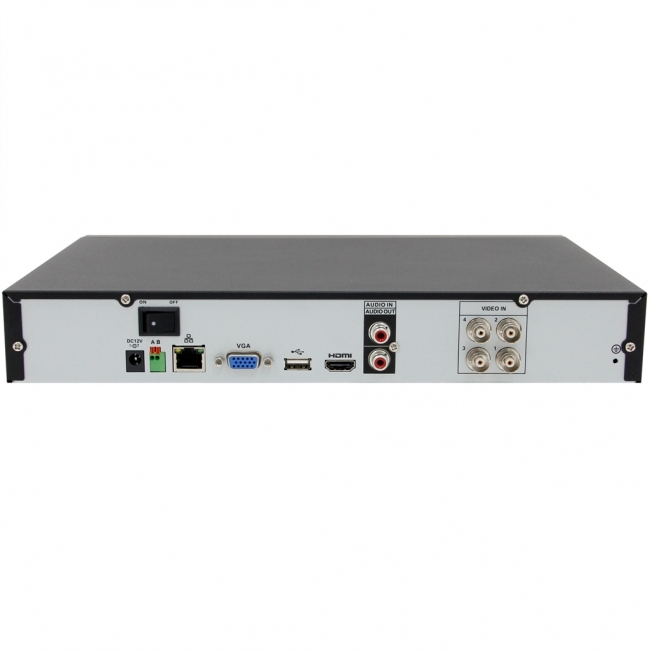 This 4 Camera DVR has a high speed processor with embedded Linux operating system that stays free of any viruses or Trojans. It comes with the same great user interface as all of our other DVRs, and uses H.264 encoding to record video at great quality while conserving hard drive space. It supports up to 1080P resolution video, which is equivalent to Bluray quality. Compared to traditional analog CCTV cameras, the picture size you record is about 80% larger. That means you get more digital zooming ability on recorded video compared to analog. This 4 camera Tribrid DVR recorder also offers control of Pan Tilt Zoom cameras. 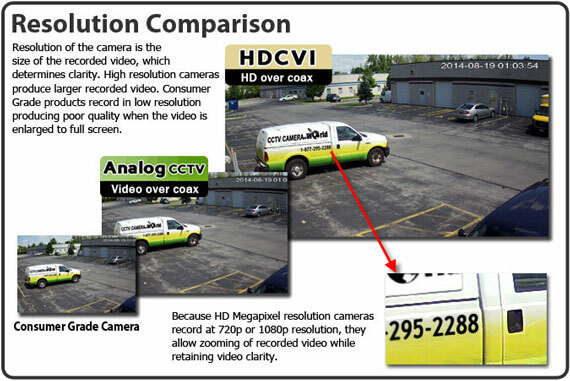 When using our HDCVI PTZ cameras connecting a PTZ is very easy. Simply provide power to the camera using its power supply, and run one coax cable from the camera to the DVR. That one coax cable (RG59U or better) will send video and data commands from the DVR to the camera, making PTZ setup plug & play. All of the DVRs we stock come with motion activated recording, which you can use to conserve hard drive space and record only when motion is detected by the intelligent software on this DVR. The motion activated feature can also alert you on your mobile device when activated, and you can also playback video from your phone or tablet. It supports all the popular smart phones and tablets, you can find a full list of supported devices in the features list below. Back-up of recorded footage is a breeze. Simply connect a USB flash drive to the front USB port, and with a few clicks of the mouse on the DVR interface, you can select cameras and date/time frames which you would like to download. You can even download video over the Internet using your Windows PC and the included free software that lets you manage multiple DVRs and cameras. If you need help, with every purchase you get free technical support for the product purchased. CCTV Camera World also offers free remote viewing with our mobile apps and viewing software so you can view your cameras connected to your DVR over the Internet through your smartphone (iPhone, Android, or Windows Phone), tablet (Android or iPad), or PC/Mac computer. Dimensions 12.8" x 10" x 2.2"
I don't see RJ45 ports on this DVR. How do you connect IP cameras to it. I am looking for a lost cost option to use existing analog cameras while allowing for upgrade to current cameras in the future. This item is a HDCVI DVR, and not an NVR that would need RJ45 ports. There is one RJ45 port to allow connection of the NVR to your network. You can use 1080P IP cameras with this NVR by plugging your IP camera to a PoE switch to power the camera and provide network connectivity. The switch and the DVR would connect to the same router so they are on the same network and can talk to each other. Will this unit work with my existing HDCVI DVR cameras? Yes it will work with any HDCVI camera, either it be 1080P or 720P. I am interested in get a Tribrid DVR to connect IP cameras and analog cameras. The system will have also a switch to provide network connectivity. But I would like to mount an SSD HDD inside because it will be mounted in a vehicle. Is SSD HDD compatible? We have only tested Samsung 840 evo and 850 evo SSD drives with our DVR. This DVR is a Tribrid and does allow use our ip cameras. You will need a poe switch to power the cameras and connect to your network. As of 2017 you can add up to 3 ip cameras up to 5mp on this unit. Is HDCVI similar to SDI? We have some SDI monitors that we may want to use. As explained in our article What is HDCVI? they are different video modalities and are not compatible with each other.